ACULAR® ophthalmic solution is supplied as a sterile isotonic aqueous 0.5% solution, with a pH of 7.4. ACULAR® ophthalmic solution is a racemic mixture of R-(+) and S-(-)- ketorolac tromethamine. Ketorolac tromethamine may exist in three crystal forms. All forms are equally soluble in water. The pKa of ketorolac is 3.5. This white to off-white crystalline substance discolors on prolonged exposure to light. The molecular weight of ketorolac tromethamine is 376.40. The osmolality of ACULAR® ophthalmic solution is 290 mOsml/kg. 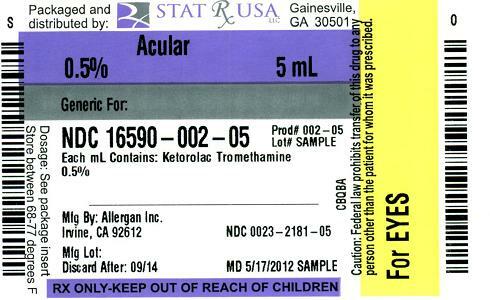 Each mL of ACULAR® ophthalmic solution contains: Active: ketorolac tromethamine 0.5%. Preservative: benzalkonium chloride 0.01%. Inactives: edetate disodium 0.1%; octoxynol 40; purified water; sodium chloride; and hydrochloric acid and/or sodium hydroxide to adjust pH. Ketorolac tromethamine is a nonsteroidal anti-inflammatory drug which, when administered systemically, has demonstrated analgesic, anti-inflammatory, and anti-pyretic activity. The mechanism of its action is thought to be due to its ability to inhibit prostaglandin biosynthesis. Ketorolac tromethamine given systemically does not cause pupil constriction. Two drops (0.1 mL) of 0.5% ACULAR® ophthalmic solution instilled into the eyes of patients 12 hours and 1 hour prior to cataract extraction achieved measurable levels in 8 of 9 patients' eyes (mean ketorolac concentration 95 ng/mL aqueous humor, range 40 to 170 ng/mL). Ocular administration of ketorolac tromethamine reduces prostaglandin E2 (PGE2) levels in aqueous humor. The mean concentration of PGE2 was 80 pg/mL in the aqueous humor of eyes receiving vehicle and 28 pg/mL in the eyes receiving ACULAR® 0.5% ophthalmic solution. One drop (0.05 mL) of 0.5% ACULAR® ophthalmic solution was instilled into one eye and one drop of vehicle into the other eye TID in 26 normal subjects. Only 5 of 26 subjects had a detectable amount of ketorolac in their plasma (range 10.7 to 22.5 ng/mL) at Day 10 during topical ocular treatment. When ketorolac tromethamine 10 mg is administered systemically every 6 hours, peak plasma levels at steady state are around 960 ng/mL. Two controlled clinical studies showed that ACULAR® ophthalmic solution was significantly more effective than its vehicle in relieving ocular itching caused by seasonal allergic conjunctivitis. Two controlled clinical studies showed that patients treated for two weeks with ACULAR® ophthalmic solution were less likely to have measurable signs of inflammation (cell and flare) than patients treated with its vehicle. ACULAR® ophthalmic solution is contraindicated in patients with previously demonstrated hypersensitivity to any of the ingredients in the formulation. It is recommended that ACULAR® ophthalmic solution be used with caution in patients with known bleeding tendencies or who are receiving other medications which may prolong bleeding time. Information for Patients: ACULAR® ophthalmic solution should not be administered while wearing contact lenses. Teratogenic Effects: Pregnancy Category C. Ketorolac tromethamine, administered during organogenesis, was not teratogenic in rabbits or rats at oral doses up to 109 times and 303 times the maximum recommended human topical ophthalmic dose, respectively, on a mg/kg basis assuming 100% absorption in humans and animals. When administered to rats after Day 17 of gestation at oral doses up to 45 times the maximum recommended human topical ophthalmic dose, respectively, on a mg/kg basis, assuming 100% absorption in humans and animals, ketorolac tromethamine resulted in dystocia and increased pup mortality. There are no adequate and well-controlled studies in pregnant women. ACULAR® ophthalmic solution should be used during pregnancy only if the potential benefit justifies the potential risk to the fetus. Nonteratogenic Effects: Because of the known effects of prostaglandin-inhibiting drugs on the fetal cardiovascular system (closure of the ductus arteriosus), the use of ACULAR® ophthalmic solution during late pregnancy should be avoided. Caution should be exercised when ACULAR® ophthalmic solution is administered to a nursing woman. Safety and efficacy in pediatric patients below the age of 3 have not been established. The most frequent adverse events reported with the use of ketorolac tromethamine ophthalmic solutions have been transient stinging and burning on instillation. These events were reported by up to 40% of patients participating in clinical trials. Other adverse events occurring approximately 1% - 10% of the time during treatment with ketorolac tromethamine ophthalmic solutions included allergic reactions, corneal edema, iritis, ocular inflammation, ocular irritation, superficial keratitis, and superficial ocular infections. Other adverse events reported rarely with the use of ketorolac tromethamine ophthalmic solutions included: corneal infiltrates, corneal ulcer, eye dryness, headaches, and visual disturbance (blurry vision). Clinical Practice: The following events have been identified during postmarketing use of ketorolac tromethamine ophthalmic solution 0.5% in clinical practice. Because they are reported voluntarily from a population of unknown size, estimates of frequency cannot be made. The events, which have been chosen for inclusion due to either their seriousness, frequency of reporting, possible causal connection to topical ketorolac tromethamine ophthalmic solution 0.5%, or a combination of these factors, include corneal erosion, corneal perforation, corneal thinning and epithelial breakdown (see PRECAUTIONS, General). The recommended dose of ACULAR® ophthalmic solution is one drop (0.25 mg) four times a day for relief of ocular itching due to seasonal allergic conjunctivitis. For the treatment of postoperative inflammation in patients who have undergone cataract extraction, one drop of ACULAR® ophthalmic solution should be applied to the affected eye(s) four times daily beginning 24 hours after cataract surgery and continuing through the first 2 weeks of the postoperative period. ACULAR® ophthalmic solution has been safely administered in conjunction with other ophthalmic medications such as antibiotics, beta blockers, carbonic anhydrase inhibitors, cycloplegics, and mydriatics. Store at 15°C - 25°C (59°F- 77°F) with protection from light. ACULAR® is manufactured and distributed by Allergan, Inc. under license from its developer, Roche Palo Alto LLC, Palo Alto, CA, U.S.A.